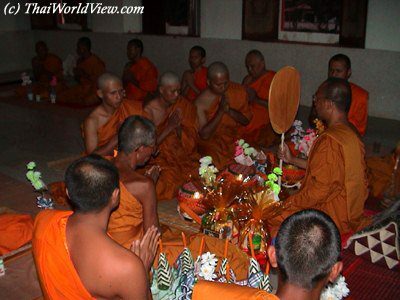 A Buddhist ordination takes place traditionally during two days. 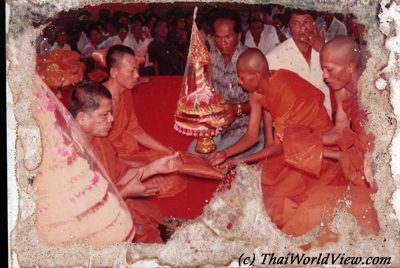 The first day happens into the family circle and is related to the ordination preparation ("PHITI BUAT NAK" - พิธีบวชนาค). The last day related to the ordination takes place in the pagoda. On the second day afternoon, the ordination rite takes place in the Buddhist pagoda. 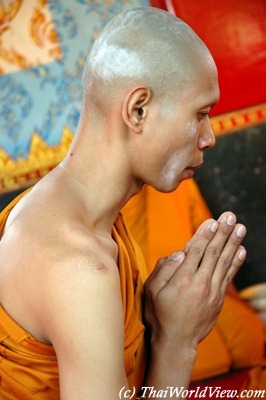 The ordination ceremony as a monk is called "PHITI UPASOMBOT" (พิธีอุปสมบท). 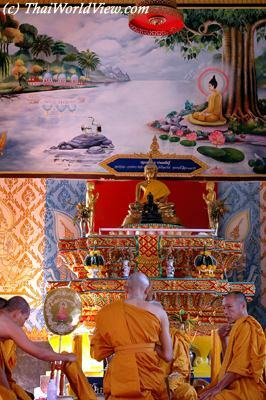 The layman enters the "BOT" (โบสถ์ - the finest building where monks are assembled for rites) and answers to questions asked by the abbot of the temple. 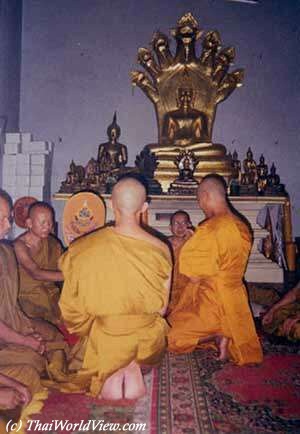 In a temple, some men are monks since decades but there are also some men who are monk only during a short time. The candidates answer to questions asked by the priest ("UPACHANA" - อุปัชฌาย์) who officiates at the ordination ceremony. Some questions are "Do you have debts ? ", "Do you have mother and father permission to become a monk ? ", "Are you a male human being ?". The last question came from Buddhist legends when a "PHAJANAK" (พยานาค) or snake disguises itself into a human being in order to become a monk. BBuddha discovered the trickery. 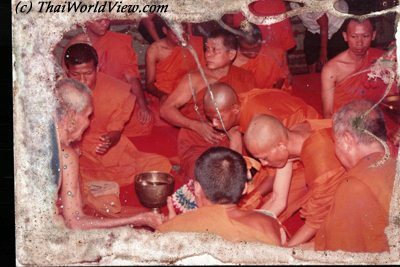 The "PHAJANAK" was not allowed to become a monk but since this time all candidates to monkshood are called "NAK" (นาค). The question "Are you a male human being ?" is also linked to the fact that women cannot become monks in Thailand. 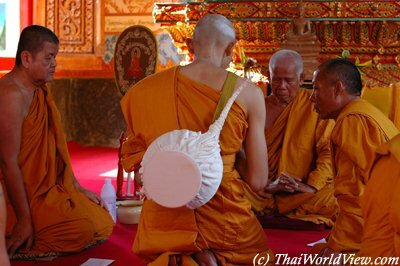 Foreigner can also become monk but it is then important to speak well Thai and to learn some Pali words. Anyway in some forest temples in Isan area, there are also ordinations in English. The new monk has learnt how to wear the monk clothes and is back in the main chapel to listen to the abbot's last recommendations. Sometimes the candidate is so nervous that he forgets the answers he must say to the abbot. Then this one whispers the answers in order to help him. The new monk receives a new monk name in Pali language. He is now part of the monkhood. 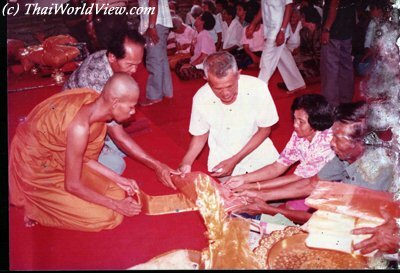 Ordination is an important part of life in thai society. A boy that becomes a monk for a few months is making a really good action towards his parents. Often the mother offers the white robe to her son. 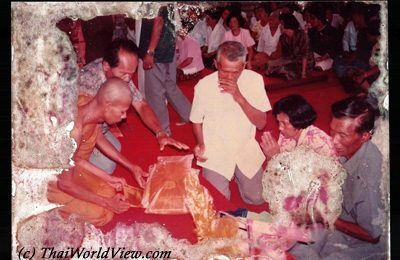 It is a great moment for a Thai mum to see her child becoming a monk. Moment of joy and proud. Ordination happens when the boy is 20 years old. Parents having three boys often believe that they won't go to hell if their three boys become monks. The new monk learns how to wear the monk clothes. 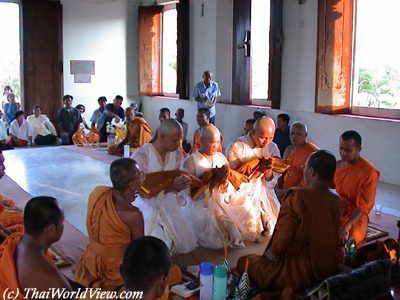 Learning to wear the monk robe is not easy at all, there is a special way to get dressed. It shall be a perfect fit because monks do not wear underclothes. The young man is now a monk. He could be a monk for one day, one week, one month, three months during the rain retreat, a year or his whole life. Who knows? The three new monks have learnt how to wear the monk clothes and are back in the main chapel to listen to the abbot last recommendations. 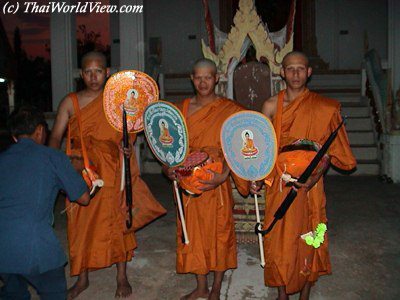 The three candidates are now monks. They can be monks for a few days, a few months, a few years or all the life. Who knows? It is a personal decision.